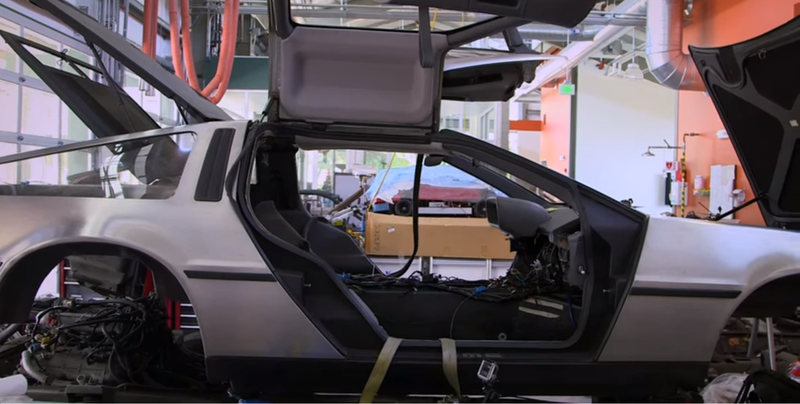 A team of engineers at Stanford University teamed up with Renovo Motors, the makers of a Corvette-like all-electric car, to build a self-driving electric DeLorean. The group unveiled the prototype yesterday, just before the day Marty McFly time-travels to in the “Back to the Future” film franchise, which popularized the DeLorean. There’s a twist to Stanford’s approach to the self-driving capabilities of the vehicle. Automakers are introducing driver assist and self-driving features to alleviate driver responsibilities and make the experience more enjoyable especially in situation like heavy traffic, but instead Stanford focused on automating extreme driving situations like drifting and making donuts. The concept called MARTY, short for Multiple Actuator Research Test bed for Yaw control, is the brainchild of Stanford professor of mechanical engineering Chris Gerdes. Jonathan Goh, a mechanical engineering graduate student in Gerdes’ Dynamic Design Lab, has been leading the research around the vehicle. According to Gerdes, Renovo focused on MARTY’s electric drivetrain and platform, while the Stanford team primarily worked on subsystems and algorithms which are most important to their research goals. One of Gerdes’ ultimate goals for MARTY is to drift alongside another car steered by a professional driver.